According to Behnke, several desiccated basins west of Alvord Basin and north of Lahontan Basin hold redband trout as their native trout species. One of those redband trout holding basins is the Fort Rock Basin. The redband is a unique subspecies adapted to the Fort Rock Basin ecosystem. In these closed high desert basins, redband trout have evolved to survive in environments with vast extremes of both water flow and temperature. 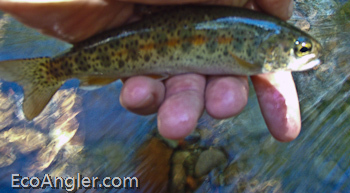 According Behnke, Fort Rock Basin redband are one of only eight separate desert basin populations of interior native redband trout. The Fort Rock Basin redband exist today in the Silver Lake basin as three seperate populations. These populations occupy tributaries of Paulina Marsh. Today, Paulina Marsh is much smaller than its historical range and has been broken into small, disconnected fragments near the outlets of the tributary streams. Food production has lead to extensive draining and channelization over much of the original marsh. A hatchery has been introduced in this basin as well in Thompson Reservoir in the upper Silver Creek. It's believed fish escaping the hatchery are interbreding with wild redband downstream of the reservoir. 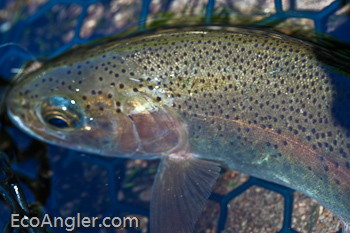 The hatchery stocks domesticated coastal rainbow trout. The other two redband populations are not affected by current hatchery programs. 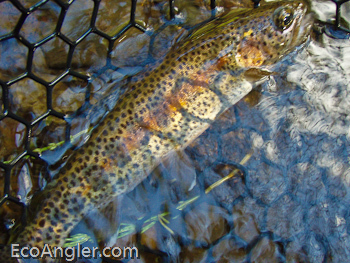 This is not to imply that other non-native trout species are present.